Meet once a week with Santa Monica Playhouse theatre artists to create an always awesome piece of original theatre. 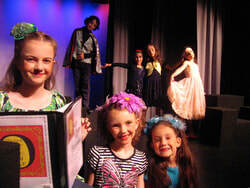 Bring us your ideas, dreams, concerns and together we'll craft a professional production from start to finish, where you learn how to mount a play and channel your creativity through exciting and unique theatre and acting techniques, writing exercises, singing, dancing, and of course, performing. Confidence, a steady work ethic, and a sense of fulfillment are added bonuses. No experience needed, but even the most advanced young actor will benefit from this class. The session culminates in a performance for the public and family/friends. Questions? Comments? Ready to enroll? Please email us or call us at 310-394-9779 ext 3.